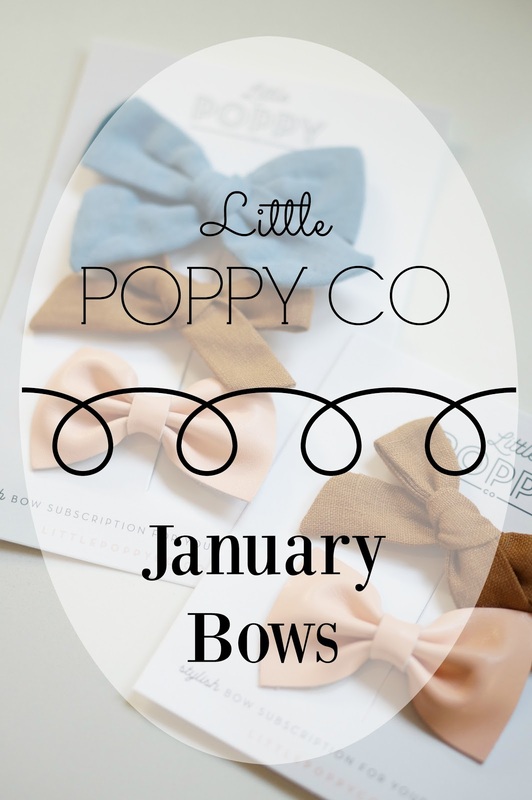 If you have a daughter and want to build up her bow collection, then this post is for you! Even if you don’t have a daughter, this post might be for you. If you happen to have a niece or another little girl in your life, these bows are an amazing gift. On Black Friday, Janssen from Everyday Reading shared a coupon code for Little Poppy Co. Little Poppy Co is a subscription bow box that ships every month. I thought it would be an awesome idea to build up Izzie’s bow collection. She already has a little collection of bows, but most of them are very busy. I have a hard time finding plain bows that we both like. When I looked at the page dedicated to past bows, I immediately signed up for a subscription. I figured we could try it for just one month, and using the Black Friday code would at least make it cheaper. The bows are not expensive at all, when you consider how much you can spend on bows at stores. For $11.99, you get three bows. You can sign up for two sets, which would obviously be double the price. When you sign up, you choose between headband bows or alligator clip bows. Since Izzie is older, I obviously chose the alligator clips. What I didn’t realize before signing up is that they offer a pigtail option. For an additional $6.99 per set, you can have two additional bows. The two pigtail bows match two out of the three bows for the month. Since Izzie loves wearing her hair in pigtails, and we rarely have two matching bows, I went for that additional option. Over on Instagram, I shared our first month of bows. Luckily, I had signed up in time for the December bows. We had super cute Christmas colored bows to wear all month. She wore them every where. They’re so pretty, but they’re also basic. So, even if we’re at home she’ll have a bow in her hair. Just one more thing that impressed me before I share pictures of the January bows. Izzie’s bows are forever slipping out of her hair. She got her fine hair from me, and I remember bows never staying in my hair when I was young. The Little Poppy Co bows have a little rubbery grip on the alligator clip that keep the bows in all day. That has probably been the most impressive part of the bows to me!